On Saturday September 6th, the much anticipated 15U/16U League kicked off it's inaugural season. At approximately 9:00 am the flag was raised, the teams took the field and the umpire yelled out "PLAY BALL!". It was an exciting day not only for the young men playing the game, but also an exciting moment for all those that have fought so long to make this dream a reality. The reality of this dream was made possible with the help of many, but heading up this project for MYBA was Commissioner Dale Davis and Secretary Larry Falcon. They began working very hard on this project back in the Spring Season, determined to finally make it happen. Special recognition and praise needs to go out to Dale Davis in particular, who invested and continues to invest a huge amount of his time, efforts and physical labor to improve the Big Field at Chandler Park an incredible Field Of Dreams for the youth of Mansfield. 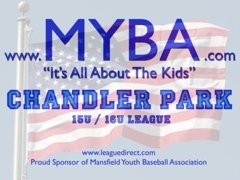 Dale loves MYBA and and is passionate about making sure Mansfield fosters a great environment for those that love to play the game. Dale...YOU ARE THE MAN! You are making great memories for lots of baseball lovers. We are especially proud as well of our Umpires that called the games Saturday (Dennis Williams and John Rutledge). They will call most of the games throughout the season. The very first thing I heard as I was walking up to the field Saturday was from a Head Coach that walked up and said "Wow, you guys did an excellent job in selecting the umpires. These guys are great". The day went without incident, and there were lots of smiles that left the field that day. Thank you to the Coaches, Parents and Umpires for making this "All About The Kids" and letting them play the game they love!